5 DAYS OF VEGAN, GLUTEN FREE MEALS! I love finding healthy recipes that are good for my body and mind. I truly believe that who we are heavily depends on how we eat and that our system cannot work properly if we do not nourish it properly. In saying that, I love EVEN MORE doing it with people I love ...... YOU GUYS!! I am so excited to announce the best collab with Amanda! Her beautiful and effortless instagram is @mamaeatsplants and her blog is HERE! 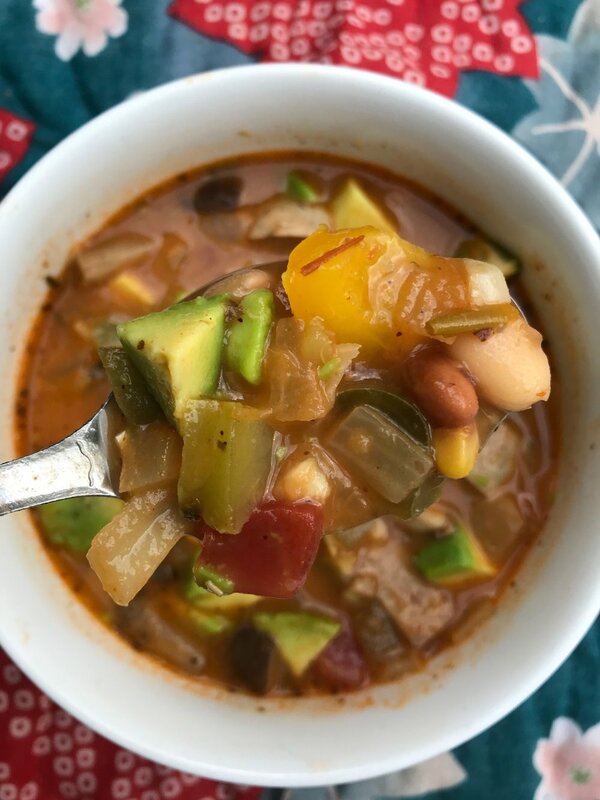 We came up with a 5 day dinner meal plan (and some extra goodies) that focuses on vegan, gluten free, and low waste dishes and you do not need to be all or any of these things to participate, you just have to be excited to try some new recipes with us! The unique thing here is that we will offer the grocery list on here, and we can all go grocery shopping this weekend to kick it off together. You, Amanda, and I will all be making them together each night! We have also accommodated generous portions so save it for leftovers for lunches, snacks, sharing with friends etc..! This is supposed to be fun and setting your mood is a must! Play some music, get your sillies and stagnant energy out before hand and dance if you need to de stress and then enjoy the art of cooking. It's so important for me to embrace everything that goes into making a meal- the chopping, the washing, composting scraps, every part of it is beautiful and so important in making an amazing meal! Amanda and I both love to get our sweat on - I love to run and she loves to do yoga so we will both be doing that to keep our heads on for the week, join us! If you want some easy tips on running just keep scrolling my blog and the post is up for some easy running tips! For getting started on yoga, Amanda recommends THIS beginner yoga video by the amazing Ali. Remember that Amanda lives in California and I live in New York so we both have regionally different produce in season - we understand you do too so work with what you have and you can replace anything you like! 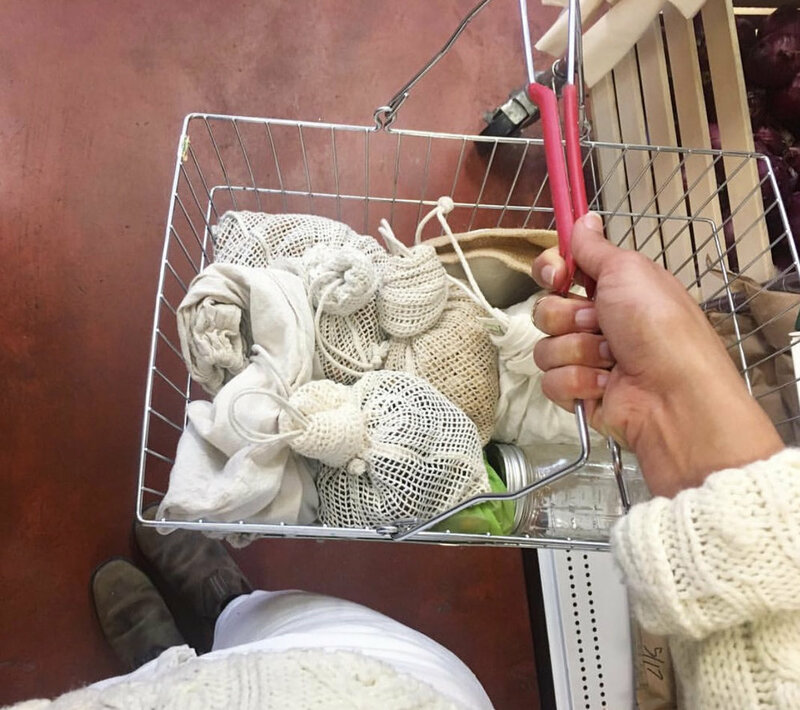 Bring your cloth totes and produce bags to make it low waste and always opt for packaging that isn't plastic if you can! Glass, aluminum, cardboard, paper, and compostable materials is all okay and can be recycled over and over! It's okay if you're not perfect with it, just try your best! GET SHOPPIN Y'ALL! Here's our grocery list! chickpeas, either 2 cans or 1.5 cup dry and then soaked and cooked ahead of time (click HERE for a primer on how to cook chickpeas to have aquafaba leftover too to use for the brownies). whole grain mustard (I like the Maille brand and it comes in a glass jar)- if you already have dijon in the fridge feel free to sub that. Just don't use yellow. OKAY! Now that you have your grocery list, here goes the order of our dinner this week! 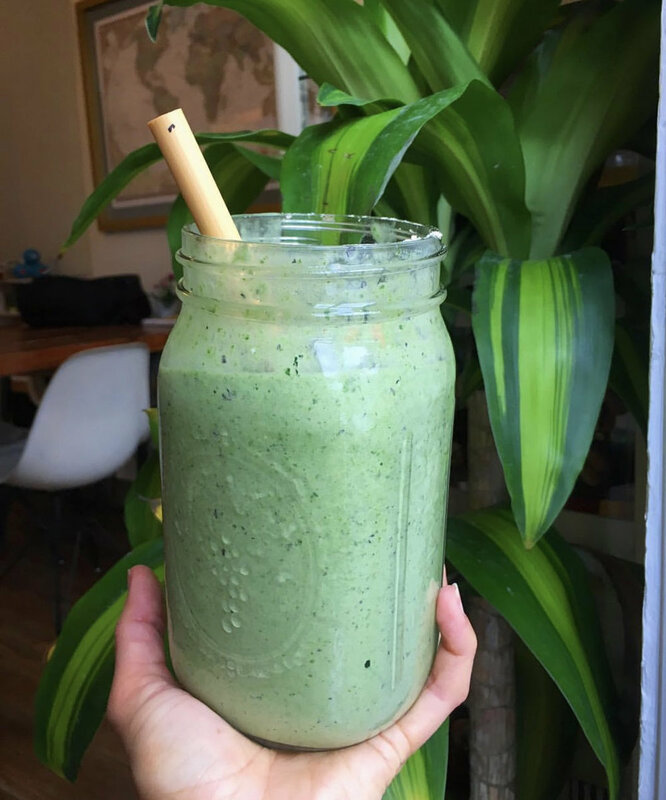 Optional micronutrient smoothie- have it daily, once, twice, never, whatever. Optional dessert - double chocolate chip cookies- have it all day, everyday, or maybe just after dinner! 1. Rinse and drain lentils. Put aside. 3. Add lentils and water to saucepan and bring to a boil. Then reduce heat and let simmer for 30-35 minutes. Should be mid-soft with chew. Add more water if you need or drain a bit out if it’s ready with too much water. 4. At the same time the lentils are simmering, process oats into flour using what you have (I used a magic bullet). In a large mixing bowl, put aquafaba (or chia seeds) at bottom of bowl. 5. Add oat flour and the rest of the ingredients besides parsley and salt. 6. When the lentils are done, put with the rest of the ingredients in the bowl. Mash with fork or masher until lentils are broken up and it’s sticky enough to be rolled into balls. Add parsley and toss in enough to combine. 7. On skillet (cast iron preferably) add grapeseed oil (or another high heat oil) and then add the lentil meat balls and grill all sides of each ball until nice and crispy brown on all sides. 8. Heat up your marinara sauce in a sauce pan. 8. 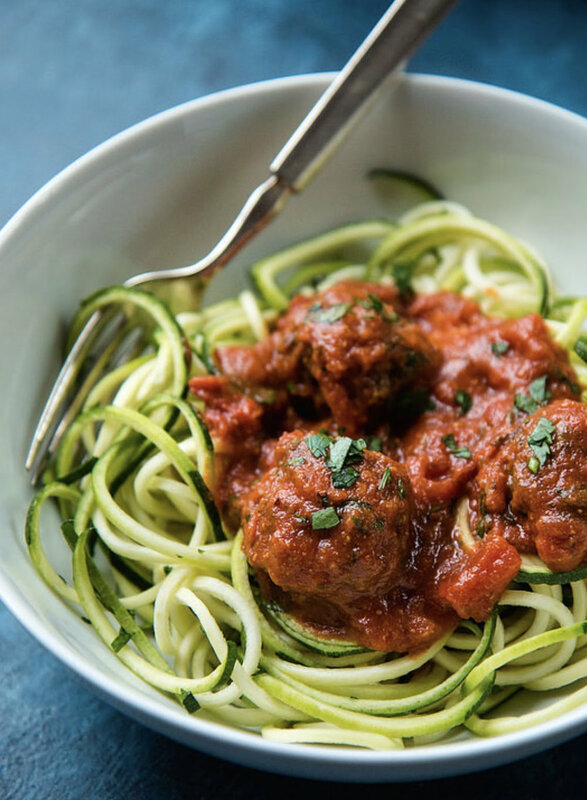 Put your base at the bottom of your bowl, then load it up with your lentil meatballs then top with marinara sauce! 1. Cut 2 beets into wedges and place in a steamer basket, cook until tender. 2. Wash and add the beet greens to the steamer the last couple minutes. 3. Sauté shallot and garlic with a drizzle of olive oil and salt for a few minutes until softened. Add quinoa and water and bring to a boil. Cover and reduce heat to simmer. Cook 15 minutes or until tender. Turn off heat and set aside. (can be made ahead of time). Save 1/2 for tomorrow's lunch if desired. 4. Meanwhile, slice your mushroom(s), and the onion (save the other half of the onion for tomorrow). Place in a pan over medium high heat and cook, adding oil or splashes of water or broth until tender, then drizzle in the aminos and stir around until absorbed. Set aside. 5. Drain and rinse your chickpeas. If you have time/prefer crispy chickpeas, you can toss with a little oil, smoked paprika, and salt and bake in a 450 degree oven for 15 minutes while the quinoa cooks. You probably won't eat all the chickpeas but you can save leftovers for lunch the next day with your leftover quinoa! 6. Blend all the ingredients for the dressing until super smooth. You can also whisk it (really well) if you want. This should make extra for lunches! Keeps up to a week in the fridge in my experience. 7. Assemble bowl and drizzle the dressing on top and add avocado. totally optional add ons: toasted pumpkin seeds and pickled/fermented veggies. 2. Roast sweet potato (either drizzled with oil and salt or without, up to you) on a lined baking sheet (parchment or silicone mat) at 400 until tender, about 30 minutes. (alternatively, do this ahead of time to reduce overall time till dinner). In the last 10 minutes, add the hazelnuts to the oven (either on a free spot on the baking sheet with the sweet potatoes, or a separate baking sheet. Depending on the size of your hazelnuts, you may need a bit shorter or longer time to toast. Keep a close eye on them so they don’t burn. 3. Meanwhile, cook the lentils. Cover with plenty of water and some salt in a medium pot, cook till tender (about 15-20 minutes), drain and set aside. This can be also be done ahead of time. Save half of the lentils for tomorrow. 4. In the bottom of a medium sized bowl, add all dressing ingredients and whisk to combine. 5. Roughly chop a handful parsley. 6. Roughly chop the toasted hazelnuts. 7. Into your bowl, add a few big handfuls salad greens. Add as much or as little lentils as you like and toss to coat the dressing over. Add the sweet potatoes on top and the parsley, and sprinkle hazelnuts over. 1. Preheat the oven to 400 degrees if baking- or not, if sautéing. 2. Into a pot with a steamer basket, add your potatoes and cook till fork tender. 3. On a lined baking sheet, place the potatoes and take a flat bottomed cup or glass a gently press down to smash them to a 1/2 inch or so thickness. Brush with a bit of oil and bake until crispy, about 20-30 minutes (alternatively, you could pan fry if you prefer for a shorter time till dinner). 4. Put a dry (no oil) skillet over high heat and let heat up for a minute or two empty. Add in your kale and let cook without stirring for a few minutes until the edges start to get a little toasty. 5. Now add in your oil and stir fry the kale around the pan, tossing until tender- about 3 minutes or longer depending on how soft you like it. 6. Add in the grated carrots and garlic and toss constantly for about 30 seconds until you start to smell the garlic (don't let it burn). Add in the leftover lentils and aminos and toss to heat through. 7. Serve with potatoes, leftover citrus tahini sauce, avocado and chili flakes. 1. Preheat oven to 425 degrees. Chop everything as directed. 2. Slice a butternut squash in half and place face down on oven sheet at 400 degrees. 3. In a big pot caramelize onions by adding oil, onions, spices, & maple syrup until onions are lightly browning and translucent on medium heat. Stir occasionally. 4. After about 10 minutes add cubes of sweet potato, garlic and braggs coconut aminos, sautee for 15 more minutes on medium heat. Cover with lid stirring occasionally. 5. Add veggie stock, tomato paste and diced tomatoes and let simmer for 10 minutes. 6. Take out butternut squash, dice and scoop out of skin. 7. Add butternut squash, coconut milk, chickpeas, and all the greens, and water if you want it to be more soupy. Let simmer a bit longer so the flavors can all hang out and party together. 1. Add the kale, chard, spinach, and choice of milk or water to your blender, bullet, or food processor (whichever you have). Blend until smooth and no big green chunks present. 2. Add rest of items - frozen banana, apple, carrot, tomato, avocado, blueberries, hemp or flax seeds, cinnamon and ice. 3. Blend until smooth and creamy! Enjoy! This yields a really big 32 oz jar, it’s filling and a perfect way to get a big dose of micronutrients in the am! 2. In big bowl, mix all ingredients together. Stir until it is all combined and place in freezer. 4. Form into golf sized balls and place on a reusable silicon baking mat, parchment paper, greased aluminum foil or greased cooking sheet.